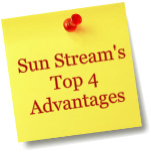 The Sun Stream One Person is a great space saver and super easy to assemble. Its size makes it perfect for apartments or anywhere space is at a premium. Small in size but big on performance and features. Our One Person has the same 1650 Watts of power as our Two Person with our Nano-Carbon heaters positioned to provide an effective concentration of ‘Focused Infrared’ for the sauna user. The Sun Stream 2 Person Corner is a unique design in the marketplace. Our 2 Person Corner sauna is smaller than many corner designs. It provides the aesthetic appeal of a 5 sided ‘neo-angle’ sauna with the convenience of a Regular Plug-In. Our design is sized to ensure optimal intensity of Infrared and air temperature. 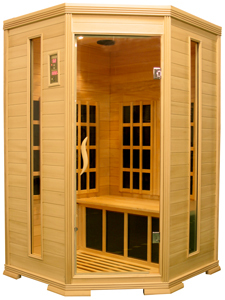 Many corner saunas on the market are larger in size with little more power. This results in lower levels of Infrared and unheated areas in the room. Our Sun Stream design ensures that you are immersed in soothing Infrared heat, your body is warmed quickly and you enjoy a heavy sweat. The Sun Stream 2 Person is our most popular size. It provides adequate room for two people or comfortable, spacious room for one. The 2 person features our Nano-Carbon heaters positioned to provide an incredible concentration of ‘Focused Infrared’ on your body to ensure a quick heavy sweat! Lots of Radiant Heat power with the convenience of a Regular Plug-In. 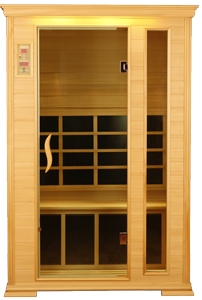 Sun Stream’s heaters are produced by Golden Wave Saunas using Nano- Carbon material from Japan. 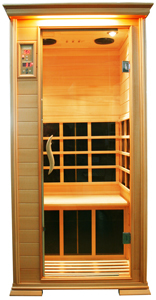 Golden Wave is one of very few Infrared sauna manufacturers to develop and produce their own carbon heaters. The heaters are backed with a Lifetime Warranty and have been used in Infrared therapy products for 10 years. They are patented in numerous countries including Germany and Japan and have been tested by several independent laboratories to verify their Infrared output. Test results have confirmed the Nano-Carbon’s high Infrared output and desirable therapeutic frequency range. Sun Stream’s Nano-Carbon heater panels are positioned to Focus Infrared upon your body. Most sauna brands have inexpensive ‘Low Watt Density’ carbon heaters. Low Watt heaters are easily recognized as they cover much of the inside walls of the sauna and extend up above the sauna user’s head. These heaters waste Infrared in unoccupied areas of the sauna and produce low levels of Infrared. Sun Stream Saunas feature an ‘Open Design’ Heater Guard in conjunction with movable back rests. We intentionally minimize the wood slats in front of our heaters so that the Infrared projection is not blocked. We do not use covers on our heaters. Cloth, felt or mesh covers are common on most Infrared sauna heaters. These are synthetic materials that are often glued to the heater surface. These heater covers are used for aesthetic purposes but we regard them to be unnecessary and detrimental to the sauna’s performance. Heater covers introduce unnecessary synthetic materials into the sauna and reduce the amount of Infrared projected from the heater into the sauna. Sun Steam leads the industry with our unrivalled cabinetry work. Our elegant designs are manufactured from top grade Hardwood Basswood with care and precision. Our saunas are made to the standards of top quality furniture and are a great addition to any decor. Rigorous quality control and state of the art machining ensure that our saunas consistently deliver their superior ‘Fit & Finish’. 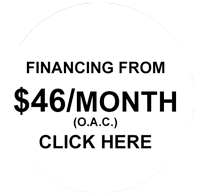 Legal Disclaimer: Affordable Hot Tubs & Saunas Ltd., do not provide medical advice, education or treatment. The information contained in this site is for general information purposes only and does not address individual circumstances or medical conditions. It may not be right for you and should not be relied upon in making decisions about your health. Always consult your doctor for medical advice.